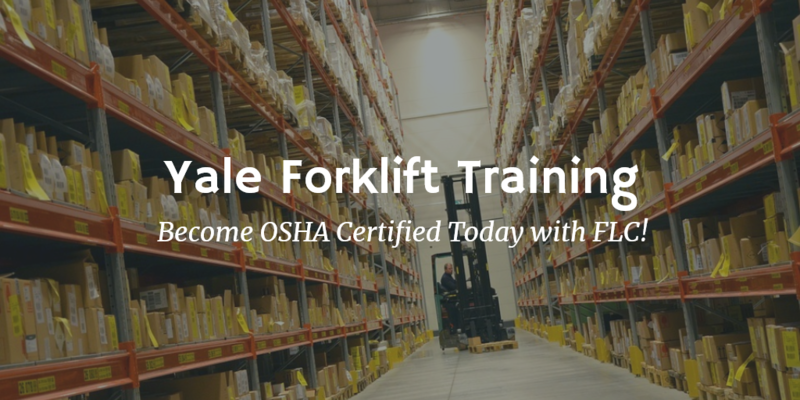 Yale Forklift Training – Become OSHA Certified Today with FLC! The Yale Materials Handling Corporation is one of the most trusted, well-known forklift manufacturers in the world. Yale is a subsidiary company of Cleveland-based NACCO Industries. With a growing product line of all sorts of powered industrial trucks, Yale continues to set the standards for innovation, reliability, and dependable performance. If you’re a forklift driver, there’s a pretty good chance you’ve already operated a Yale forklift. And if you haven’t, there’s an even better chance you eventually will. With FLC certification, you can learn how to safely operate a wide range of Yale forklifts – which will boost your career prospects. Yale forklifts are utilized by companies all across the United States, and on a global scale. If you’re an employer and use this type of powered industrial truck, Yale forklift training is essential for a safe, well-run workplace. It’s also the law, as OSHA requires that employers provide all training for their employees. With ForkliftCertification,com, the leader in online OSHA compliant training, you’ll have everything you need to get your workforce aligned with the latest approved safety standards. FLC’s forklift training courses review all the important safety concepts you need to know regarding Yale electric forklifts and internal combustion trucks. This has a two-fold benefit. Number one, you’ll have the most up-to-date knowledge on Yale forklifts (and powered industrial trucks from other companies). And secondly, you’ll put yourself on the employment map, so to speak. Companies need safety-conscious Yale forklift operators – and with FLC, you’ll show potential employers that you’re serious about your career! If you can’t decide between the Training Kit and Train a Trainer course, we also offer another outstanding Yale forklift training option – the Bundle Package. Give FLC a call today (our OSHA experts can be reached at (888) 278-8896) and get started with the most comprehensive Yale forklift training program today. Thanks for visiting FLC, your source for complete Yale forklift training!